What brings me to the Himalayas? That’s a question I am asked often. I sigh; an inexpressible deep love for it. A lot of people ask me what makes me live in the mountains, despite being a city girl. To tell you the truth, I don’t have all the answers yet. To simplify this, all I can say is that the Himalayas feel like home. That’s the closest I can get to define my love for it. A part of me wonders often “It’s been over five years here, it’s no joke. Why am I here?” The very next moment, I tell myself the reason doesn’t matter. All that I can be grateful for is that at present it is a gift to cherish. And the gift hasn’t been a smooth journey. I had to shed my old self to embrace the new. I had to figure out a path that I wasn’t prepared for. But by the grace of the universe, it somehow fell in place. This year has been a journey of focussing on my priorities, creating art, writing for myself, managing my art venture Iktomi, taking my time off from blogging and social media and living fully. This year has been about fully engrossing myself in life and counting my blessings. 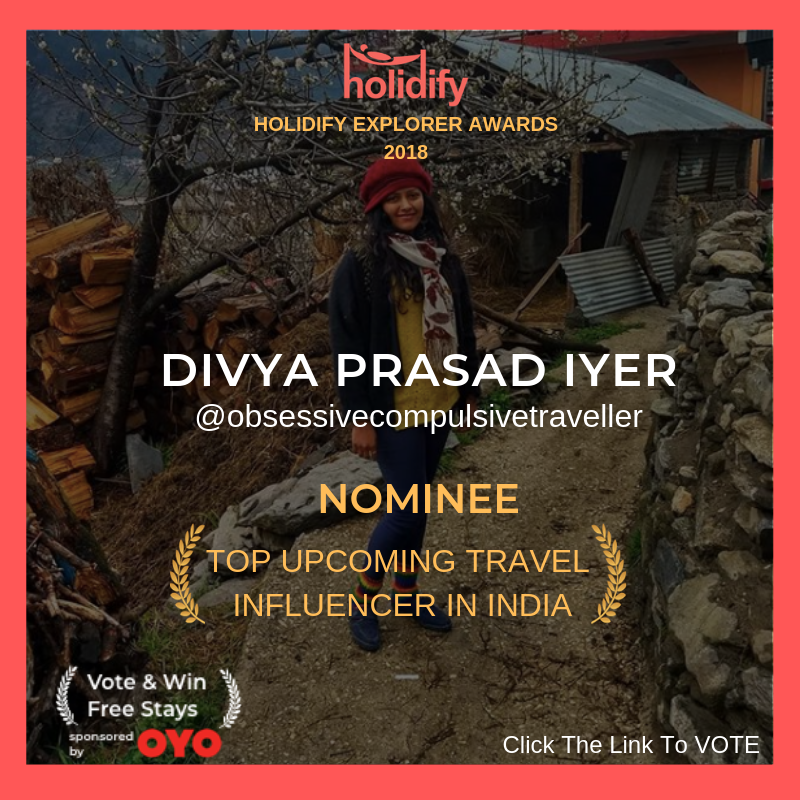 I made some memorable trips in the mountains, especially re-visiting Lahaul, Miyar Valley, a trek from Lahaul to Zanskar, Sainj valley, some new villages in Himachal Pradesh, North-East India and Sabah in Malaysia to name a few. As my birthday passed this month, I felt how much I have grown and how far I have come. 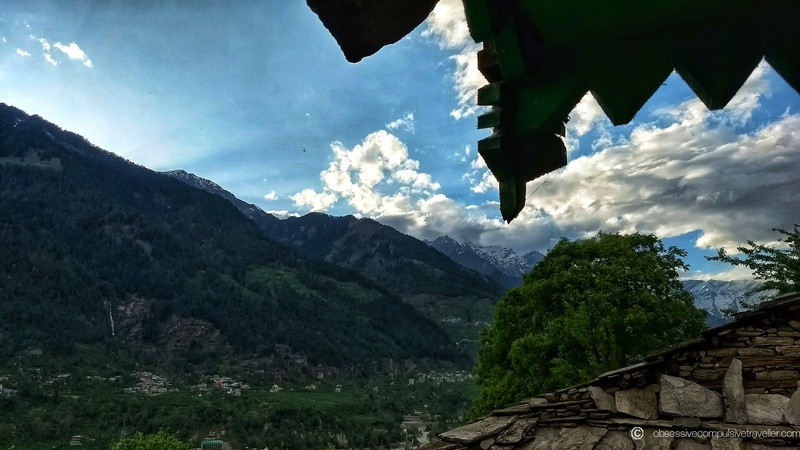 As yet another year slips past, moving on to 2019; I am emotionally overwhelmed how long this journey has been – over 11 years of my love story with Himachal and five years since I moved base to this heaven. It’s the kind of love that lets you be. Integrated and in your element. One that’s non-judgemental. It doesn’t want to know who I am, what I do and why I am here. It doesn’t care about what I have been through. It isn’t hushing and gushing about me. Its changing seasons, imparting its wisdom and lessons through myriad phases of my own life. It just lets me be and loves me for what I am at that very moment. . On a funny note, the best part is it doesn’t care if I am a writer, or an artist or travel blogger. It keeps reminding me I am so much more than all this. Beyond my imagination, my visions. Beyond my limitations, my own beliefs. Beyond my knowledge, my awareness. Beyond my own perceptions and others’ perception of me. It’s the kind of love that holds you through thick and thin. One that has your back when everything is great and nothing is alright. One that feels like conversations with God. One that feels safe yet gets you out of your comfort zone. One that doesn’t let you escape yourself nor life. The one that’s like a Guru – pushing and nudging you to be a better version of myself. To be your own teacher. One that lets me breathe in and breathe out my thoughts and feelings. Accepting me just the way I am; than a preconceived idea of me. Lifting my spirit with its momentary creations. Clearing up the unwanted by showering its love. It sheds your ego layer by layer; reminding you of the breathing creation you are. That our spirits can withstand anything. That our existence itself is a waking dream. The mountains’ love is a constant reminder of the contentment, wholeness, and abundance of my being. On a deeper level, mountains taught me fearlessness and surrender. It teaches one to trust that a larger truth is at work, even if I don’t fully understand it yet. The love of the mountains breaks you one day; yet makes you the other day. One that travels deep within you. A love that never needs to leave. A magical synchronicity; a love that finds you when it’s time. In 2008, there came a time in life when I wanted to commit myself to my dreams and passions. I chose to take a break from my career to focus on myself. This soul-searching led me to long journeys across the tribal circuit of Himachal Pradesh, all the way up to Jammu & Kashmir. The universe had blessed me with this unlimited ticket to my soul. 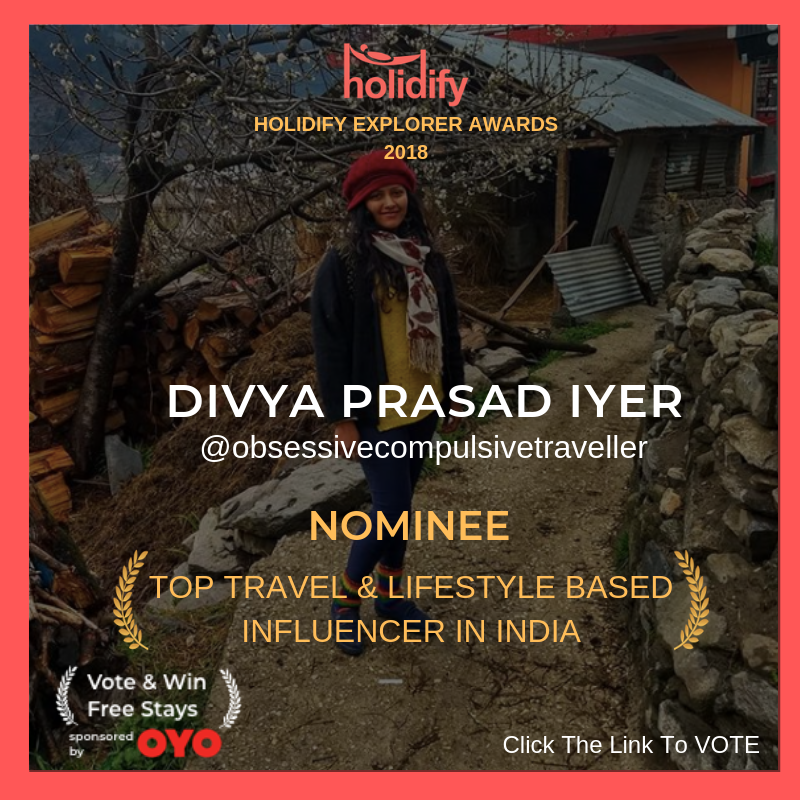 I lived in remote villages of Lahaul- Spiti, Kinnaur, Kullu valley, Lahaul- Spiti and Ladakh. My blog became a medium to express and share my experiences. I hadn’t started it with a commercial angle, yet what started as a hobby gained momentum professionally over time. I earned valuable experiences from the tribes I encountered. I was moved each day. I channelled those feelings into my writing, painting and meditation. Journeying through lengths and breadths around Himachal and Jammu & Kashmir only fuelled my faith. My affirmations found movement. Lahaul valley in Himachal Pradesh was one of my first few solo trips at a time when it was untouched by tourism. This led me to explore other valleys on my own. I always preferred the local HRTC buses in Himachal because they are cheap and safe as you are with the locals. They aren’t the most convenient rides, but they are well-connected to the remotest parts. No matter how back-breaking the rides are; they are by far the safest and reliable modes of transport. I shared my time with refugee kids in Ladakh during winters. My role was to share my skills with them and take them out on picnics. It changed me as a person since they didn’t know what a picnic felt like. These kids lived in remote villages and nothing felt more meaningful than sharing my time with those who are not as fortunate as us. Yet they were joyful and abundant. Around this time, I met with Brokpa tribes, Balti tribes of Turtuk, Nomadic tribes of Tso Morriri, and traditional Shamans. Living with them was an opportunity to learn about their culture and way of life. There is so much to learn from people who are living with joy and contentment even in the harshest conditions. Each morning, I met beautiful souls on my way. Something within shifted as the landscapes moved past my bus window. Playing this movie called ‘new life’ along the way. The remoter it got, the purer everything felt. I was graced by many homes and new friends on the way; ones that I could return to, even today. Often a monastery or an unknown home became the roof over my head. The ideas about myself and what my life should be; disappeared with each sunset. Security became merely a matter of existing in the now. Thoughts of tomorrow no longer kept company. I looked back at the life I had left behind in a new light. Letting go became a compulsive habit. A new home, each day. The heart-wrenching memories of souls I connected with became my treasures to carry to yet another new home. It was in every sense a connection with myself. A part of me was still figuring out the practical aspects of life. My savings and my untouched Provident Fund weren’t forever. The most important decision was to figure out a way that makes this dream possible. This was nowhere close to an escape; but rather a closeness and reconnection with life. With these journeys, I realized that travel is a process to learn and expand yourself. It can be an opportunity to connect, contribute and grow. It is much more than the sensory experience of a place. Since then, slow travel positively became a part of my life, than just a goal to chase. The road to your dreams is truly worth your love and energy – enroute Chandratal, Spiti. It was the starriest night in Komic village. As I sat by the gompa wondering what is my life made of; I had this strong feeling that I can create what I genuinely want. Once I put in all the love, intention, efforts, and nourishment into my dreams; it is the best investment regardless of the outcome. During my stay in Komic; I frequented the Gompa once in a day. The signs and synchronicities started to appear. One evening, I sat by the Komic Gompa having this deep conversation with a monk on the mathematics of life. He added with a mystic glee “Minus – Minus is plus”. It meant a lot of negative and challenging circumstances will add to your growth. Because it’s these experiences that will transform you at the core. 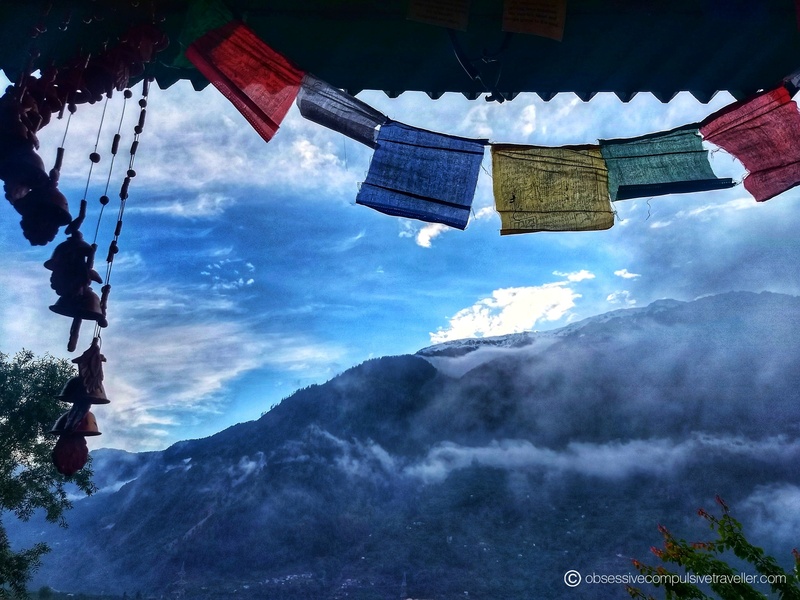 And if you are being tested time and again with these challenges, it means you are capable of receiving the gift of transformation.” Sipping on the hot butter tea offered at the Gompa, I gulped down these profound lessons on life. As I was leaving from Komic village, my host family offered me a pair of Ammonites they found in the forest as a parting gift. Back then, I accepted them as I was fascinated by the fossils. After three months, I came back to Bombay feeling clearer. More so; because my family was unable to comprehend this back then. Little did they know, the dreamer in me was awakened. My Pouda – for nature’s spectacular show by the verandah. These journeys in the mountains had opened a door within. This door had to be kept open. Spiritually, mentally and emotionally, these journeys revealed profound meanings. This transedence enriched my mind, body and spirit. And the only thing that was needed is a strong will, motivation, and plan that works for me. I committed to freelancing to keep the balance. 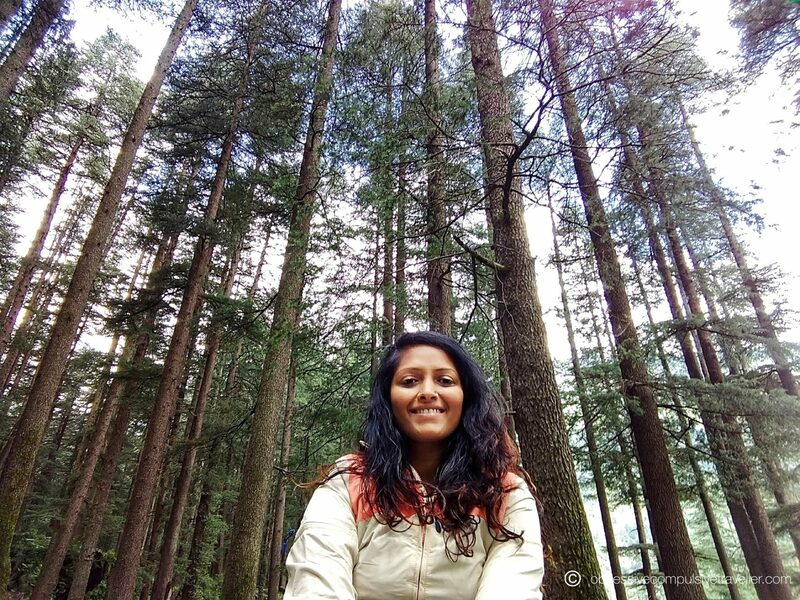 Life as digital nomad came with its hiccups yet it was fulfilling. Today, the reason why I started my blog keeps me driven and content. I am counting my blessings more than my travels. As I set my intentions to make it work; opportunities started to flow in. In fact, more doors opened. It was 2013 when life took an unexpected turn. It is during this phase that Reiki happened to me. From there on, many more doorways to healing opened up. I was initiated into meditation early in life, and Reiki re-established my connection with myself. The Himalayas were a blessing every time I arrived there or left. I finally moved to Dharamsala to pursue my extensive studies in Prana, Colour, Crystal, Mudra, Psychosomatic, Psychic and Yogic healing. I also started my sacred geometric arts venture –Iktomi, wherein I weave crystal dream catchers and mandalas. But it was only when I learned crystal healing, I understood that ammonites carry the soul path of the person who receives them and they were metaphysical treasures to have. Now it made sense why that parting gift in Komic was so special. A few months before my initiation into crystal healing; I happened to trek to a crystal mountain accidentally and carried back a few clusters of clear quartz. A year later, I travelled to Africa on an assignment. I had the opportunity to live with several tribes in South Africa, Swaziland and Kenya. With my ‘Project Dream Catcher’ with Iktomi, I shared my energized dream catchers with the beautiful souls I met on the road. The quest to keep learning alternative therapies turned into a purpose. Parts of life started falling in place and made perfect sense. I visualized a life in the mountains and my dreams even more. Travel became a process of exploration of my inner cosmos through these external journeys. Despite a small pocket, I grew richer in spirit. The yearning for a bucket list ceased to exist. The trust that I will get to places and people I am meant to connect with grew even stronger. 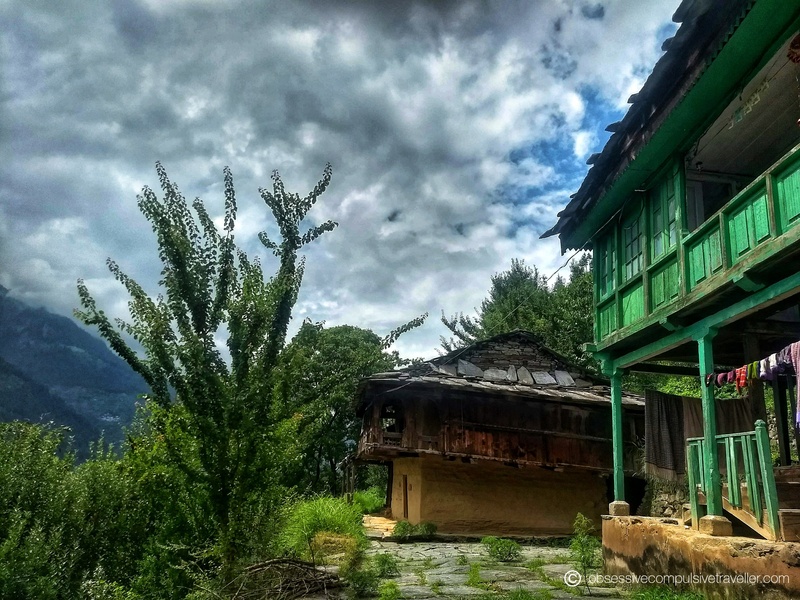 After a long stint in Kangra valley, in February 2017; I moved back to a tiny village called Jagatsukh in Kullu Valley. My mornings begin at a slower pace than I was ever used to. It took me a while to get used to the slowness of life in general. I soaked in the art of being fully present. My mornings begin with a positive conversation with myself. I meditate by my ‘Pouda’ – my verandah or the backyard on my goals for the day. Myriad colorful birds visit my backyard; making my mornings a grand show. Some moments, I absolutely love looking for patterns and figures created by the clouds; sitting by my Pouda. Then I get on with my daily routine of cleaning, groceries and cooking. Yes not many know how much I love cooking and such a foodie I am. 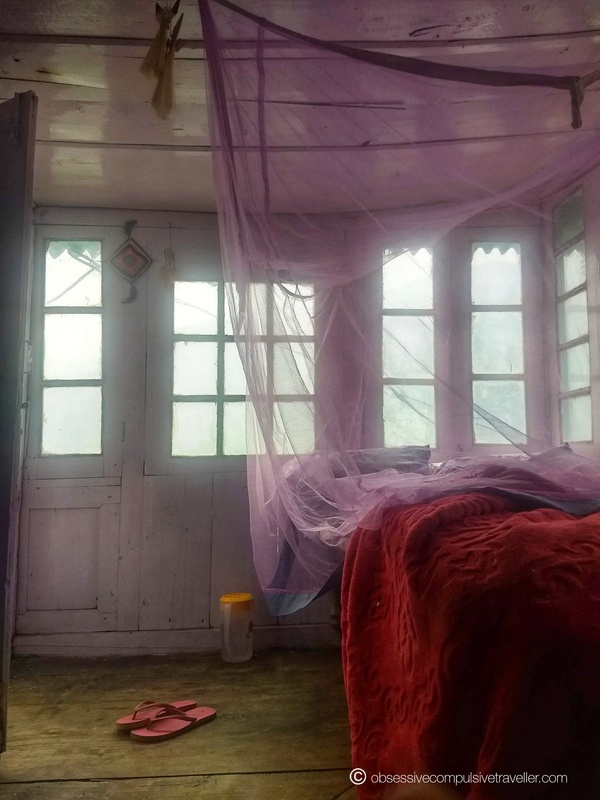 While living in a Gaddi village in Kangra valley, my day began with the only animal companions I ever had – Gulli – my cow and ‘Rooh’ – my goat. I lost Rooh to an unfortunate event. 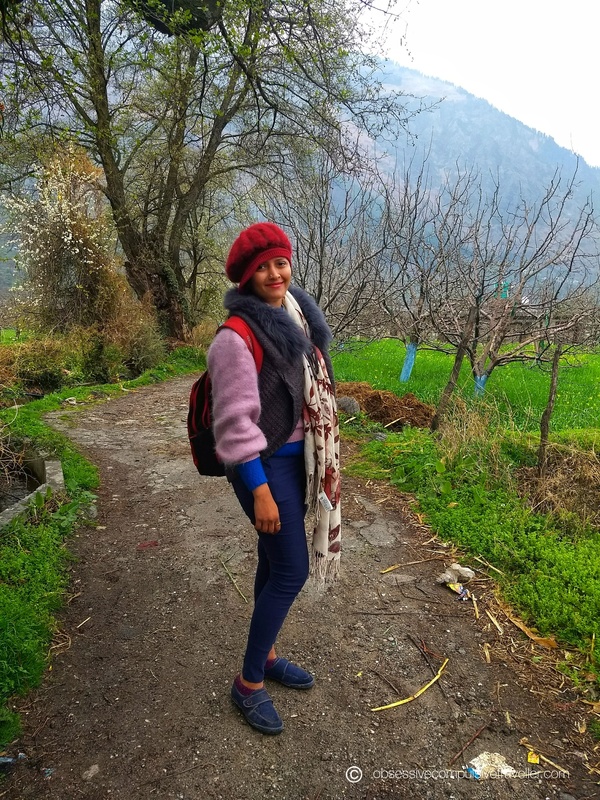 I had to let go Gulli as she was only accustomed to the lower terrains and moving her to Kullu valley seemed too complicated. It was more important for me to let her be happy and healthy, even at the cost of my closeness to her. On most days, I push myself out for a walk or hike because inaction is something I am not used to. After the morning routine, I barge into my ‘creative room’ and dedicate myself to creating something new every day. Often a painting, a mandala, dream catcher or writing in general. Making promises to myself keeps me motivated. This is followed by catching up with my assignments. This is the space where I work. Last year, I assigned a room especially as my creative space for self-motivation and commitment. Since I work from home; it’s feels great to enter this space to keep myself focussed on work. Even though I am working a lot more than my previous fulltime job, I am happy doing it. I feel nothing comes for free; there is energy exchange and Karma – action on our part. We have to earn it for ourselves. My purpose was to enhance the quality of my life; keeping the work-life balance. It brings a sense of purpose to my day. And to all those who think I am on a vacation; no I am not. I am living just like anyone else. I am grateful for it as long as it’s there. Except that I appreciate and cherish the present quality of my life against the backdrop of the mountains. The simplicity of life here amazes me. The fresh air, water and all the abundance of nature are real luxuries. It is merely a personal choice that comes with a lot of hard work. It’s something I deeply resonate with and it perfectly works for me. 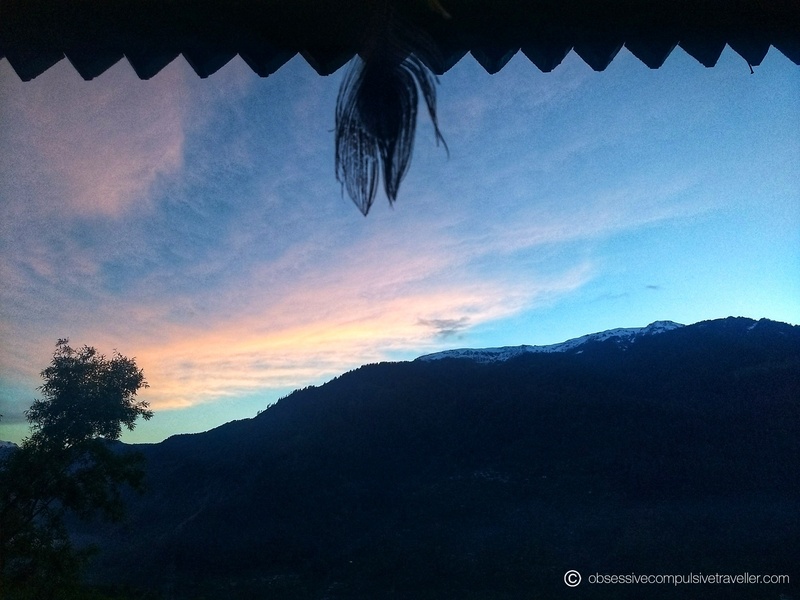 A play of clouds over the mountains by the verandah. On some mornings, the mountains lure me to explore something new. 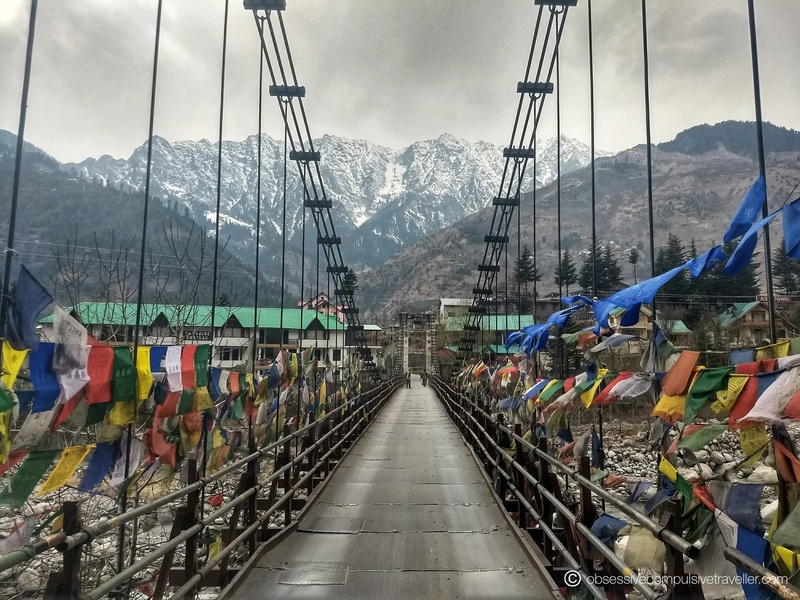 A few times a week, I embrace a hot Sulphur spring at Vashisht to warm up to the cold weather or meeting friends. Some days are about just being with myself and doing what needs to be done. On most days, the weather decides my day. Whether it’s curling up under the blanket with a book or writing or getting the yarn out to weave mandalas. Some days feel like a walk up in the forest behind my home or at Van Vihar. Some days are about getting myself out to a cafe and working. Whether to paint, write, work, get out or simply embrace doing nothing at all. 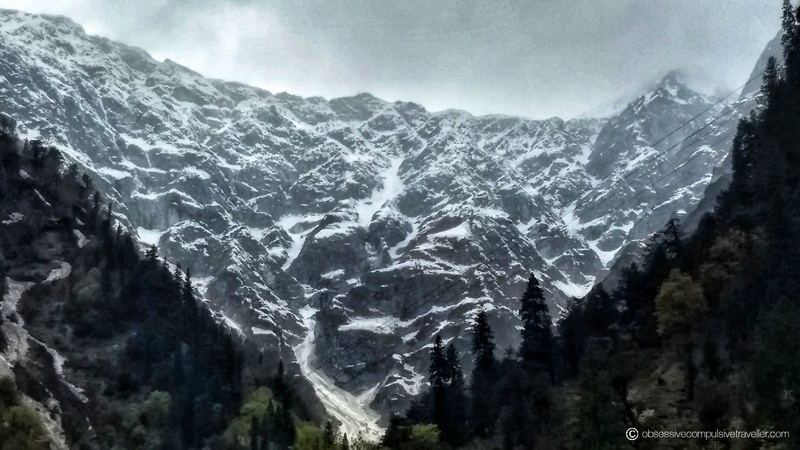 Some days feel like a conversation with the Beas river and the snow-capped mountains. Some days are blessed with the serenity and divinity of the temples of the valley. Some days feel like exploring a new place or trying something new. Some days are about simply gazing at the mountains; contemplating and reflecting on life. On some days a ‘chai’ or conversation in the village decides the course of my day. Dedicating myself wholeheartedly to whatever I decide to do has become a must. And I go with the flow. I keep myself open to life; taking it as it happens. I must admit, true to its name, Jagatsukh filled my life with all the simple joys of the universe. Often I was asked by the locals in Himachal, why I am here and I tell them, something deep inside brings me here. How much the locals wish for the life in the city I left behind. How much they yearn for a sight of the ocean. The grass is always greener on the other side, and it’s okay to feel so. Exploring the unknown comes naturally to us humans. We are all travellers at heart in this life; constantly moving from one moment to another; experiencing what’s needed to grow. Everyone has their own subjective reasons to travel. Regardless; there’s something spiritual about travel, beyond our understanding. Home is a feeling we carry in our heart. The landscapes change, mountains change, you meet new souls, but home is within you. Be it a Ladakhi or Himachali home, joy can keep you company anywhere. I learned to not take anything for granted and appreciate it while it’s there. This journey taught me to appreciate everything and everyone in life. It is so important to create your sacred circle, be it your karmas – actions, intentions or the people you surround yourself with. Choose a positive way of life that uplifts and nurtures you. More than the place you are in, it’s the inner space you are in which matters. This also helped me look at my own city in a new light. Once we commit to a path that resonates with our selves, things start falling in place gradually. Once you devote yourself to the process, the outcome doesn’t matter in the long run. When we sow joy into what we do, we ultimately reap joy. It’s important to love what you do. By the end of our journey, we must return home to love; becoming love. 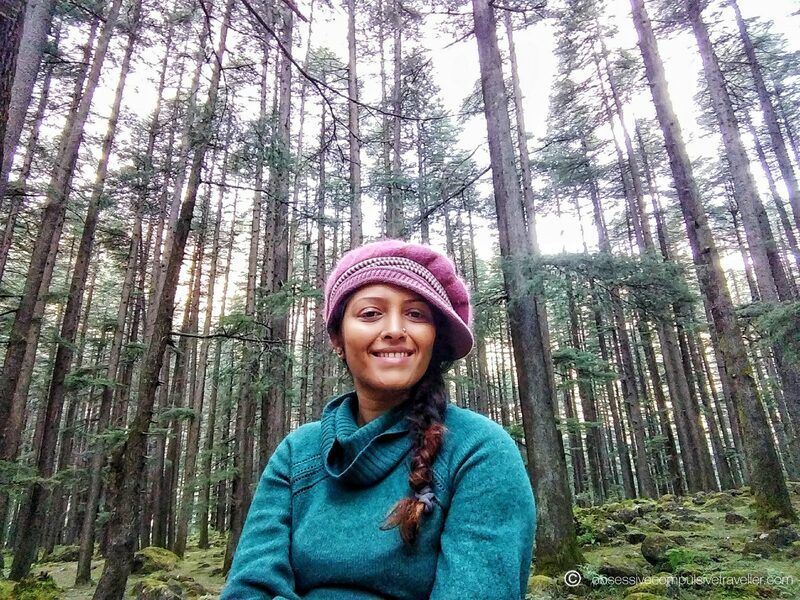 Soaking in the Deodar forest’s love and healing embrace. I am extremely grateful to my parents for supporting my dreams and encouraging me to pursue it. It took me a lot of time to make them understand, and today they appreciate it wholeheartedly. My family spends time here often and they have started to love it. Except that my father feels I wish I lived right by the road and there’s no hiking up to do. I am extremely grateful to my Himachali uncle Mr. Somdev Sharma and his family for letting out their unoccupied ancestral home to me. They have made me feel at home and always taken care of me. I express my gratitude to the generous ‘Grand Daadi’ – grandmother of the Himachali family for constantly checking on me if everything is good. And the times when she hikes up all the way only to inform me that she has prepared ‘Siddus‘, a special dish or an invitation to a local Dham indulgence. A special thanks for those days she brings me fresh vegetables and herbs straight from the farm. She has been my to-go person with whom I can talk about anything. I thank the Jagatsukh villagers and my local friends for their generosity, warmth and spirit of inclusiveness. Above all, the Himalayas have always been close to my heart, for it always felt like home. It brought in so many invaluable and immaterial gifts into my life, that I am forever grateful for it. My sentiments of gratitude for all the unconditional love from my parents, my Himachali family and all the beautiful souls who have made a difference to my life; is inexpressible in words. 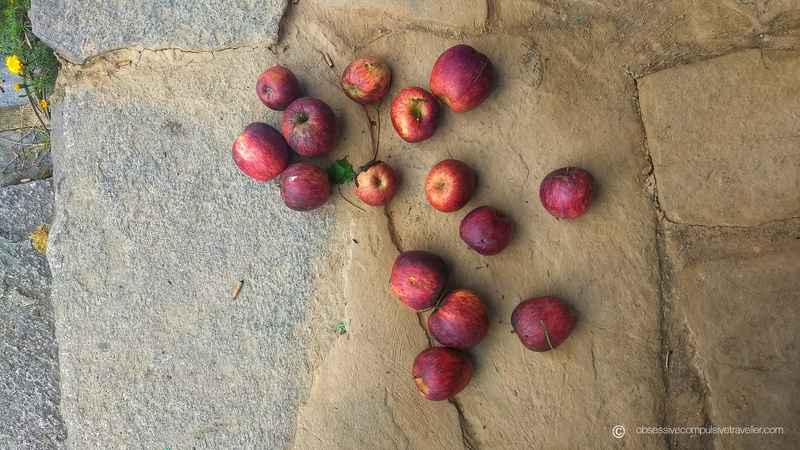 Nature’s bounties from the orchard. Folk dances to greet the Gods at the Gayatri Temple, Jagatsukh.